A Navajo Nation highway that runs from U.S. Highway 491, near Twin Lakes, NM, to Crownpoint, NM. From here the route extends until it intersects with Highway 57. At this point the route continues until it intersects with Highway 197 near the Empedrado Wilderness Study Area. This route runs through both McKinley and Sandoval Counties and is a secondary two-lane highway that is maintained by the Navajo Division of Transportation. 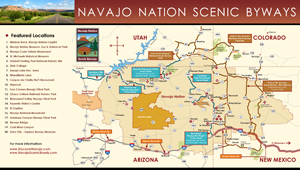 "Navajo Nation Scenic Byways, inlcuding Navajo Route 9" by U.S. Department of Transportation and the Federal Highway Administration. Final Report Prefix to Transportation Models For Navajo Nation Transportation Routes. Navajo Nation Environmental Protection Agency.